The Skeeters Baseball Foundation promotes youth education and healthy activities for culturally, racially and economically diverse populations in the Fort Bend county and surrounding areas. Our goal is to reward the kindness and support of the community by making a difference in the lives of children. By providing a number of opportunities for vulnerable populations, we are taking away the sting of isolation and welcoming them wholeheartedly to join their community. Specifically, the Skeeters Baseball Foundation has donated funds to the Alief YMCA, Arc of Ft. Bend, The Boys and Girls Club of Richmond-Rosenberg, The Dream League Challenger Division of the First Colony Little League and worked with the Sugar Land Legacy Foundation on the construction of the City’s first universally accessible playground Project at First Colony Park. Since it's inception the Foundation has raised over $100,000 with their Kickball Classic and Golf Fore Skeeters events. 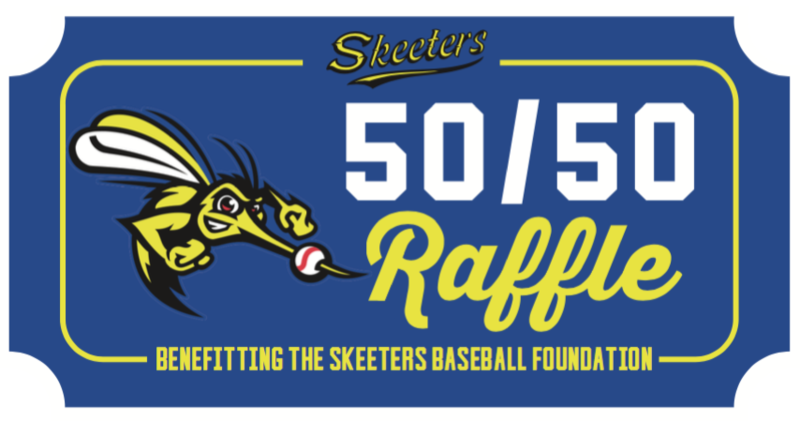 With the 2018 season, the Skeeters Foundation will implement a 50/50 raffle in which individuals can purchase raffle ticket for the chance to win 50% of that games proceeds. The remaining 50% goes to the foundation to support our mission. It is our belief that all children should have access to healthy, safe, and engaging activities. For more information, email us at foundation@sugarlandskeeters.com. SUGAR LAND, TX- On September 1, the Sugar Land Skeeters returned to Constellation Field for a four game homestand against the Southern Maryland Blue Crabs. As the smell of popcorn from the concession stand filled the concourse, it wasn’t enough to overtake the sense of gratitude from fans that attended the ballpark. The Skeeters’ 2-1 victory over the Blue Crabs on Friday marked the first professional sporting event for the city in the wake of Hurricane Harvey. Despite the heavy hearts that filled the stadium, Skeeters President Jay Miller said it was important for the Skeeters to play this homestand to bring some relief to the city. Numerous fans attended the weekend games against the Blue Crabs and donated $10,000 to Fort Bend County disaster relief to help those who have been affected by Harvey. 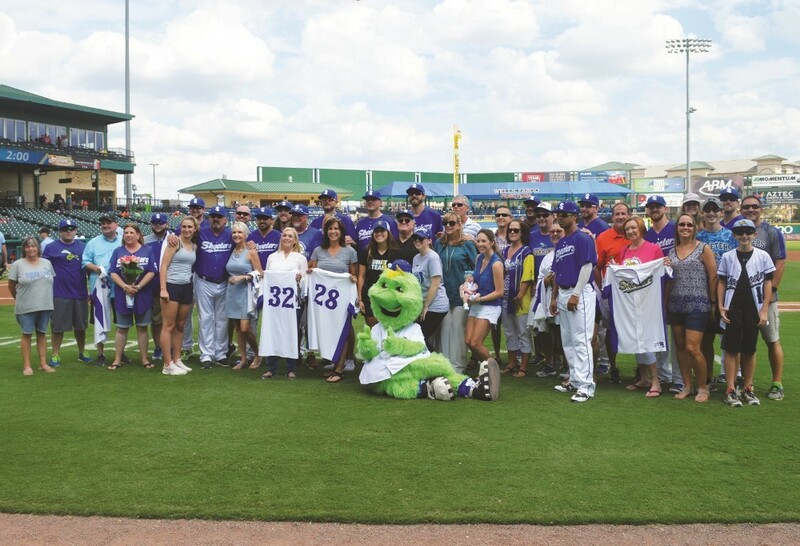 The Skeeters Foundation, spearheaded by owners Bob and Marcie Zlotnik, matched the fan donations for a total of $20,000 over the four game series. Bob and Marcie also reached out to Sugar Land Mayor Joe Zimmerman and offered Constellation Field as an emergency shelter and staging area to help local residents. Approximately 300 residents stayed at the ballpark as temporary shelter. The Skeeters organization will continue to offer first responders and evacuees free tickets to the remaining home games (Sept. 12-17) and collect school supplies for area schools. The return to Constellation Field not only meant a lot to fans but to the players as well. As Harvey was approaching the Texas coast, Skeeters player coach Travis Scott said it was tough trying to focus on baseball while their families suffered through the worst rainfall in history back at home. After being displaced in New Britain due to the intense flooding and other damages, Skeeters infielder and Houston native Bryan Pounds said he was overwhelmed with joy in their first game back in Sugar Land. Despite the aching hearts, the Skeeters’ return was a small step towards normalizing people’s lives and giving them a reason to smile. Sugar Land Skeeters Foundation promotes education and healthy activities for youth in the Fort Bend and Greater Houston area, and in 2015, The Foundation was thrilled to announce partnerships with the Alief YMCA, the Sugar Land Dream League Team and the Sugar Land Legacy Foundation, as well as the success of the Second-Annual Skeeters Foundation Kickball Classic. As part of the Foundation’s Deacon’s Dugout initiative, the Skeeters Foundation has aligned with the Alief YMCA on a three-year plan for their youth baseball program. The improvements will enable the YMCA to have new tee ball and coach pitch leagues targeted to economically disadvantaged kids in the surrounding neighborhoods. In 2017, the Foundation donated $10,000 to fully equip all players with uniforms, balls and gloves in addition to paying their league dues. The Skeeters Foundation donated $5,000 to The Arc for the purchase of new warm-up jackets for their Special Olympics athletes and head coaches. The jackets will provide a neat, uniform appearance for the delegates as they compete in local, area and state Special Olympics competitions. The Skeeters Foundation donated $5,000 to the Fort Bend Boys & Girls Club to support their BatterUp Baseball Program at the Richmond-Rosenberg Club. This program provides children with summer leagues, instructional sessions and clinics intended to not only teach the fundamentals of the sport, but to improve their overall coordination and health. The First Colony Dream League was the recipient of a $5,000 donation from the Skeeters Foundation to ensure that all children can enjoy the game of baseball by covering the costs of the league’s uniforms and equipment. 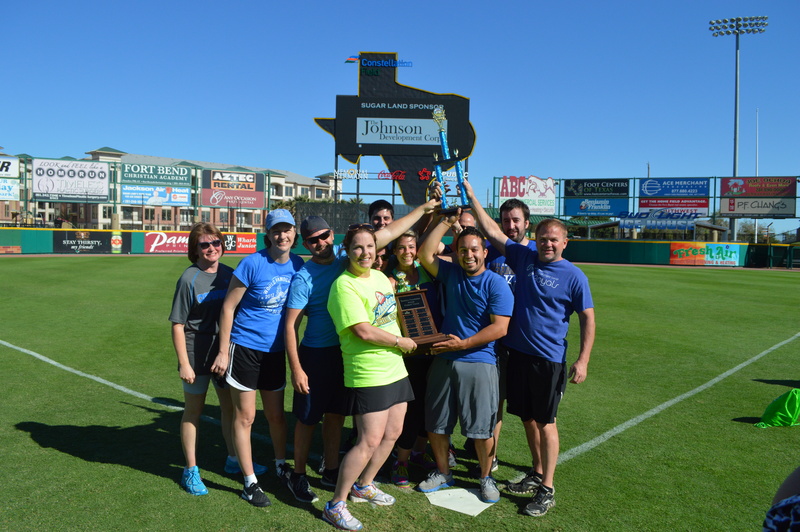 On October 1, 2016, The Skeeters Baseball Foundation hosted its third annual Kickball Classic. This event was a huge success with local area businesses joining together for a day of fun and raising almost $50,000, doubling the 2015 amount. Twenty-eight teams and over 500 players participated in the tournament, with the Roberts Markel Weinberg Butler Hailey/Sterling McCall Lexus “Bad News Barristers” taking home the Carl Favre Memorial Trophy for first place. “Don’t Stop BaLLieving” of The Snowdrop Foundation was awarded best team name and Pisula Development’s team, “2 Legit 2 Kick,” won the best costume award. As part of the Foundation’s Deacon’s Dugout initiative, the Skeeters have aligned with the Alief YMCA on a three year field improvement plan for their youth baseball fields. The improvements will now enable the YMCA to have new tee ball and coach pitch leagues targeted to economically disadvantaged kids for the surrounding neighborhoods. All players will be provided with uniforms, ball and glove compliments of the Foundation. The Foundation recently donated funds to The Dream League, the Challenger Division of the First Colony Little League in Sugar Land, Texas. The team was selected as one of two teams to play in the 2015 Little League World Series and has grown to approximately 100 physically and/or intellectually challenged players. In conjunction with the Sugar Land Legacy Foundation, a non-profit community group that supports activities and capital projects that benefit residents of Sugar Land, the Skeeters Foundation has donated funds toward the construction of the City’s first universally accessible playground Project at First Colony Park. The new playground will replace the current playground at First Colony Park and provide a place where children can play in a safe, welcoming environment that is accessible for people with disabilities. 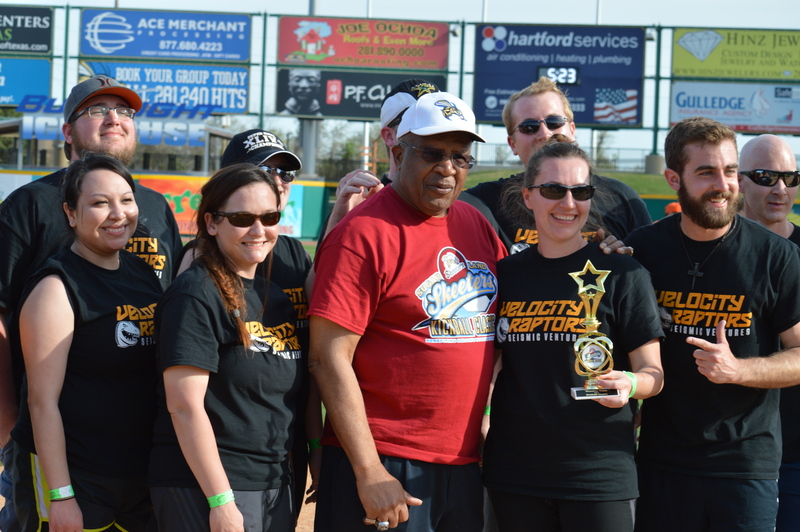 The second-annual Skeeters Baseball Foundation Kickball Classic was a huge success on Saturday, March 28 at Constellation Field. Local area businesses joined together for the event and raised an estimated $24,000, dou¬bling the amount raised last year. Sixteen teams participated in the tournament and The City of Sugar Land Royals’ took home the overall championship by going undefeated on the afternoon while the Mighty Mareks of the Marriott Sugar Land in Town Square were awarded team costume winners. 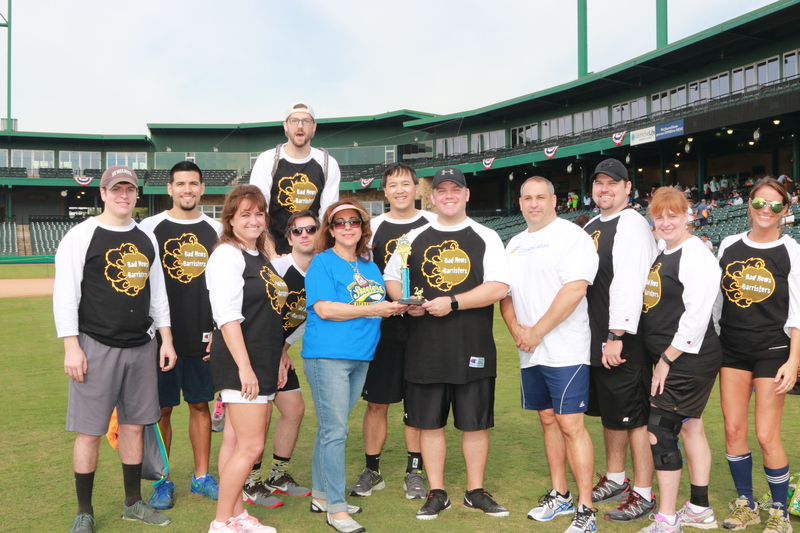 The fifth annual Skeeters Baseball Foundation Kickball Classic, held on September 29, 2018 at Constellation Field, was a huge success raising over $30,000. 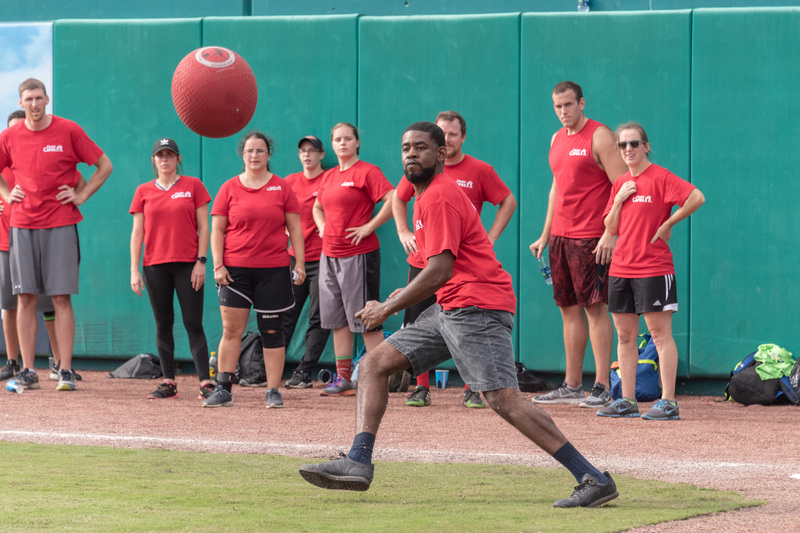 Local area businesses joined together for a day of fun-filled kickball competition in support of the Skeeters Foundation. Over 200 players participated in the tournament, with Fluor Cares taking home the Carl Favre Memorial Trophy for first place and JP Morgan taking second place. “Kickin' Grass, Takin' Names” of Hope For Three was awarded best team name and Memorial Hermann Sugrical Hospital's team, “The Incredi BALLS,” won the best costume award. 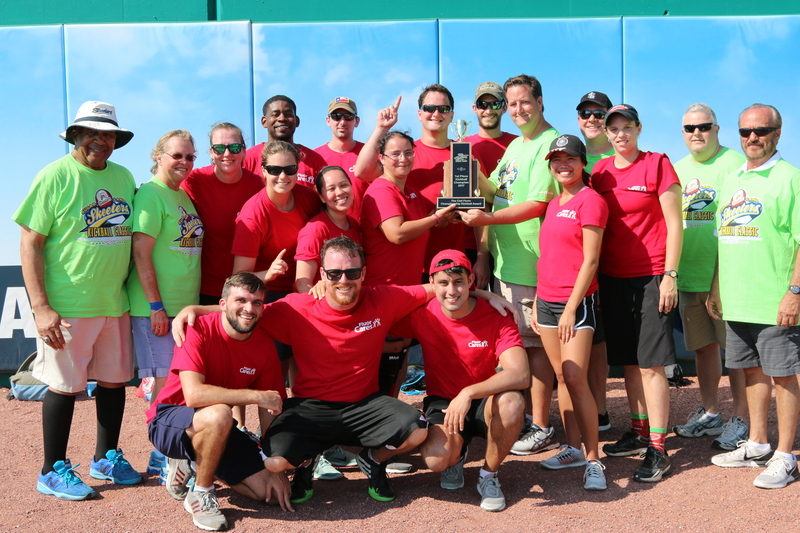 Information and registration for the 2019 Skeeters Kickball Classic will be available soon. Check back for updates! As part of the Foundation's Deacon's Dugout initiative, the Skeeters have aligned with the Alief YMCA on a three-year field improvement plan for their youth baseball fields. The improvements will now enable the YMCA to have new tee ball and coach pitch leagues targeted to economically disadvantaged kids for the surrounding neighborhoods All players will be provided with uniforms, baseballs and glove compliments of the Skeeters Foundation. To learn more about the Deacon's Dugout initiative through the Skeeters Baseball Foundation, email us at foundation@sugarlandskeeters.com. The Skeeters are grateful for the supportive team owners, community, sponsors and players for their commitment to the Skeeters Baseball Foundation. The Skeeters Baseball Foundation promotes youth education and healthy activities for culturally, racially and economically diverse populations in the Fort Bend county and surrounding areas. Our goal is to reward the kindness and support of the community by making a difference in the lives of children. By providing a number of opportunities for vulnerable populations, we are taking away the sting of isolation and welcoming them wholeheartedly to join their community. 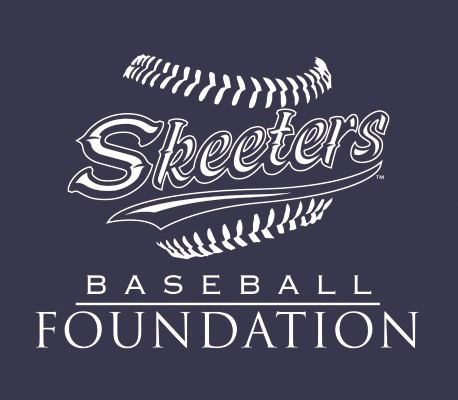 The Skeeters Baseball Foundation is a registered 501(c)3 charity, so donations are tax deductible. Please note that the donation will be made through the Skeeters ticketing partner, TicketReturn. No actual ticket is being purchased through your donation. The Skeeters Baseball Foundation promotes youth education and healthy activities for culturally, racially and economically diverse populations in Fort Bend County and surrounding areas. Our goal is to reward the kindness and support of the community by making a difference in the lives of children. By providing a number of opportunities for vulnerable populations, we are taking away the sting of isolation and welcoming them wholeheartedly to join their community. Eligibility: 501(c)(3) organizations providing programs or services targeted at improving the lives of disadvantaged youth (typically 18 and under) in our community. The following is required along with the application and must be received by Friday, March 29, 2019 at 11:59pm to foundation@sugarlandskeeters.com. 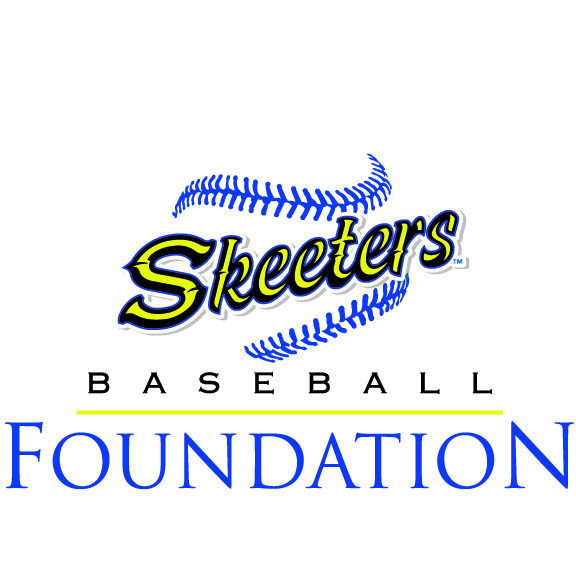 To fill out a 2019 grant application for the Skeeters Baseball Foundation, click here. Hey Skeeters Fans! Thanks for checking out our new nightly 50/50 raffle. This is your chance “to get rich or donate trying” this season. At each Skeeters home game, you will have the chance to win big with the 50/50 raffle. Just look for any of our raffle sellers throughout the stadium or visit the 50/50 booth at the main gate to secure your winning ticket. The overall jackpot will be displayed on the video board throughout the game and the winner will be announced during the 7th inning. Half of the proceeds will go to the winner and the other half go to the Skeeters Baseball Foundation to help make a huge difference in our community. 50% to you, 50% to charity, 100% worth it. From the Skeeters Baseball Foundation and on behalf of the youth in Fort Bend County, thanks for helping us make Sugar Land that much Sweeter! By participating in the Skeeters 5050 Raffle ("Raffle"), each participant ("Entrant") agrees to be bound by these Official Rules and by the decisions of the Skeeters Baseball Foundation ("Foundation" or "Sponsor"), and these Official Rules shall be binding and final as to all matters related to the 5050 Raffle. The 5050 Raffle is subject to all applicable federal, state and local and municipal laws and regulations. Some restrictions apply. Void wherever prohibited or restricted by law. Eligibility: The 5050 Raffle is open to all Sugar Land Skeeters ticket holders age eighteen (18) or older as of the date of entry. Employees, family members (defined as parents, spouses, children, siblings, grandparents, and their respective spouses) or those cohabiting (whether related or not) with Executives, Officers, Senior Management, or Directors of the Skeeters Baseball Foundation ("Foundation"), the Sugar Land Skeeters Baseball Club ("Skeeters"), Legends Hospitality, or Raffle staff members shall be ineligible for the 5050 Raffle. Sponsor: Skeeters Baseball Foundation, 1 Stadium Dr., Sugar Land, Texas 77498. Non-profit Tax ID Ticket 45-4846464. How to Enter: Official 5050 Raffle tickets ("Tickets") will be available for purchase in-person at Constellation Field ("Ballpark") with the physical address of 1 Stadium Dr., Sugar Land, Texas 77498 at every Sugar Land Skeeters home game from the time the gates open to the public, concluding at the end of the sixth inning ("Raffle Period") provided, however if a game does not start on time, or is delayed during the first two (2) innings, tickets will be sold for a minimum of three (3) hours from the time stadium gates open. You may enter the 5050 Raffle by purchasing Tickets for: Three (3) Tickets for Five Dollars ($5.00), Ten (10) Tickets for Ten Dollars ($10.00), or Fifty (50) Tickets for Twenty Dollars ($20.00) from designated Skeeters Baseball Foundation representatives stationed at the 5050 Kiosk just inside the Home Plate Gate and via roaming sellers throughout the stadium. Tickets can only be purchased with cash (United States Dollars). No discounts or complimentary Tickets will be provided. If a person does not have an admission ticket to a particular game, a Ticket may be requested during the Entry Period at the entrance to Home Plate Gate. Each Ticket is a receipt for Entrant's purchase and represents an entry in the 5050 Raffle for that game and is not eligible for any past or future 5050 Raffle drawings. There is no limit to the number of Tickets an Entrant may purchase. All Ticket purchases are final, no refunds or replacements will be issued. 5050 Raffle Tickets are Not Tax Deductible: The IRS has taken the position that amounts paid for chances to participate in raffles, lotteries, or similar programs are not gifts and, therefore, the price of the entry does not qualify as a deductible charitable contribution. Drawing: Every transaction is electronically tallied. The running total from the 5050 Raffle sales will be periodically displayed and updated on the Texas-sized videoboard. One (1) 5050 Raffle winning Ticket number ("Winning Ticket") will be selected in a random drawing from among all eligible entries received as of the conclusion of the Entry Period ("Drawing"). The Drawing will be held during the seventh inning. In the event of a weather delay, the Skeeters Baseball Foundation may, in its sole discretion, modify any pre-determined schedule with respect to the 5050 Raffle Period and/or the Drawing. All Drawings will be conducted by the Skeeters Baseball Foundation. The Winning Ticket will be announced over the Stadium's Public Address System and posted at the 5050 Kiosk by the end of the seventh inning. The Winning Ticket will also be listed online at www.SugarLandSkeeters.com/5050. Entrants do not need to be present to win. Prize: There will be a maximum of one (1) Winning Ticket selected during each Drawing. The holder of the Winning Ticket of each Drawing (the "Official Winner"), will be subject to the Official Rules, and will be awarded fifty percent (50%) of the net 5050 Raffle sales of that applicable game ("Prize"), less any and all applicable taxes or fees. The remaining proceeds shall be retained by the Skeeters Baseball Foundation, a 501(c) (3) charity, and the programs that the Skeeters Baseball Foundation supports in its sole discretion. Although applicable taxes are withheld, each Official Winner assumes all responsibility for any state, county, or federal taxes, fees and withholdings. Federal and state withholding laws are subject to change without notice. The withholding laws in effect at the time each Prize is claimed will be followed. No substitution of Prizes will be allowed for any potential Official Winner. Prizes will not be split amongst various parties. Any unclaimed Prize will be retained by the Skeeters Baseball Foundation for charitable purposes. Odds: The odds of winning the Prize will depend on the total number of Tickets purchased for each Drawing. Notifications: All Prize claims must be made within five (5) calendar days of the applicable 5050 Raffle Drawing date ("Claims Period"). The Winning Ticket must be presented in person to the 5050 Raffle staff member kiosk near the Home Plate entrance during a game, or presented to a Skeeters Baseball Foundation representative during normal business hours (Monday - Friday 9:00am - 5:00pm). Office address: 1 Stadium Dr, Sugar Land, Texas 77498. Should the tenth day fall on a Saturday, Sunday or recognized holiday, then the Claims Period shall be extended to the immediately following business day. Any transportation required for the Official Winner to submit a Winning Ticket shall be the Official Winner's sole responsibility and will not be furnished by the Skeeters Baseball Foundation. The Official Winner must provide the Skeeters Baseball Foundation with all information required to claim the Prize (including tax identification and Official Winner’s mailing address). The Skeeters Baseball Foundation has no obligation to contact potential winners. The Official Winner will receive an Affidavit, Prize Claim, Release and tax forms which must be executed and returned to the Skeeters Baseball Foundation no later than five (5) business days after his/her receipt of applicable forms. Prizes will be sent to the Official Winner's mailing address (as provided by the Official Winner) via check within four (4) to six (6) weeks after the receipt of the Winning Ticket and applicable forms. No cash payments will be made. In the event that an Official Winner: (a) does not notify the Skeeters Baseball Foundation within five (5) calendar days of the Drawing; (b) is ruled ineligible for any reason; (c) refuses the Prize; or (d) does not return all of the required forms, the Prize will be forfeited and will be retained by the Skeeters Baseball Foundation for charitable use. In the unlikely event that an error or problem in the administration of a 5050 Raffle results in more than one Entrant holding a Winning Ticket, the person holding the Ticket that was purchased the earliest shall be deemed the Official Winner. Taxes: Each Winner shall be responsible for any and all travel, costs, federal, state and local income or excise taxes, fees, assessments and like charges associated with the Prize. At the time of this printing, federal law requires that a tax withholding on certain Prize values be collected by the Foundation from the Prize prior to award and distribution. Federal and state withholding laws are subject to change without notice. The withholding laws in effect at the time each Prize is claimed will be followed. Transfer of Raffle Ticket: Entrants may opt to give away their 5050 Raffle Tickets to another eligible person, but in doing so the Entrant waives any claim he/she might otherwise have to the Prize. Entrants may not re-sell their Tickets to other parties and may not knowingly give Raffle Tickets away to another for the purpose of allowing those other parties to re-sell such Raffle Tickets. All 5050 Raffle Tickets which have been resold in violation of these Official Rules shall be void. All individuals who re-sell, purchase, or receive 5050 Raffle Tickets in violation of these Official Rules shall be ineligible to participate in the 5050 Raffle or to win a Prize. Transferred Prizes shall be bound by all the terms and conditions of these Official Rules. Winners' List: For a list of Winning Tickets and Prize amounts for each 5050 Raffle Drawing, requests may be mailed with a self-addressed stamped envelope to: Skeeters Baseball Foundation Attn: Skeeters 50/50 Raffle, 1 Stadium Dr., Sugar Land, Texas 77498. Winners' list requests must be received between October 1 and October 31 of that calendar year. Winning Tickets will also be posted at www.SugarLandSkeeters.com/5050. Release of Liability: By purchasing a 5050 Raffle ticket, each purchaser forever and irrevocably releases and holds harmless the Sponsor, the Skeeters Baseball Foundation, the Sugar Land Skeeters, their respective parent organizations, subsidiaries and affiliates, and their respective agents, advertising and promotion agencies, and affiliates, and all of their respective employees, officers, directors, shareholders and agents from and against all claims, damages or liabilities arising in whole or in part, directly or indirectly, from participant's participation and/or purchase of a 5050 Raffle ticket in the 5050 Raffle and/or a purchaser's award, receipt or use of any Prize awarded in the 5050 Raffle. Publicity Release: Each Official Winner, by accepting his/her Prize, grants the Skeeters Baseball Foundation and Foundation designees and affiliates, including the Sugar Land Skeeters, full and irrevocable permission and right to use the Official Winner's name, address (city and state of residence), photograph, voice, statements and/or likeness and Prize information for advertising, trade and promotional purposes without further compensation and without notice, review or approval, in all media (including on the Internet) or format now known or hereafter discovered, worldwide, and in perpetuity. Disclaimer: The Skeeters Baseball Foundation, in its sole discretion, reserves the right to disqualify any person tampering within the Entry process or otherwise in violation of the Official Rules. The Skeeters Baseball Foundation further reserves the right to cancel, terminate or modify the 5050 Raffle for any reason, including, but not limited to any 5050 Raffle that is not capable of completion as planned, affected by tampering, unauthorized intervention or technical failures of any sort, fraud, Acts of God, acts of terrorism, civil disturbances, work stoppage or any other natural disaster outside the Skeeters Baseball Foundation's control. The Released Parties are not responsible for: (1) 5050 Raffle Tickets which are lost, stolen, improperly issued, printing errors, counterfeited, illegible, given away, and altered or subject to other deficiencies which may limit an Entrant's ability to participate in or win any 5050 Raffle; (2) Entry payments that are delayed, misdirected, undelivered, not fully captured, or garbled in a ISP, website, computer, telephone, cable or satellite modem or connection, handheld mobile device or any other computer equipment or connection, whether or not caused by site users, tampering, hacking, or by viruses, worms or malfunctions affecting network, server ISP or any equipment or programming used in or associated with the 5050 Raffle; (3) Any other errors of any kind, whether human, typographical, printing, mechanical, or electronic in nature which relates to the 5050 Raffle, including without limitation, errors in 5050 Raffle related materials or in the administration of the 5050 Raffle, such as errors in processing Entrants, determining Official Winners, or announcing or delivery of Prizes; or any portion of the 5050 Raffle that is compromised, then the Skeeters Baseball Foundation reserves the right, in its sole discretion, to suspend, modify or terminate the 5050 Raffle. Released Parties make no warranty, guaranty or representation of any kind concerning any Prize and disclaimed any implied warranty. Failure to enforce any term of these Official Rules shall not constitute a waiver of that provision. Governing Law & Exclusive Venue: These Official Rules shall be governed by and construed in accordance with the laws of the State of Texas. Any disputes relating to the Raffle must be held in courts of competent jurisdiction in Fort Bend County, Texas.